Not to be confused with Novel. Novell, Inc. /noʊˈvɛl/ was a software and services company headquartered in Provo, Utah. Its most significant product was the multi-platform network operating system known as Novell NetWare, which became the dominant form of personal computer networking during the second half of the 1980s and first half of the 1990s. Novell technology contributed to the emergence of local area networks, which displaced the dominant mainframe computing model and changed computing worldwide. Novell became instrumental in making Utah Valley a focus for technology and software development. Under the leadership of founder Ray Noorda, during the early- to mid-1990s Novell attempted to compete directly with Microsoft by acquiring Digital Research, Unix System Laboratories, WordPerfect, and the Quattro Pro division of Borland. These moves did not work out, and NetWare began losing market share once Microsoft bundled network services with the Windows NT operating system and its successors. Despite new products such as Novell Directory Services and GroupWise, Novell entered a long period of decline. Eventually Novell acquired SUSE Linux and attempted to refocus its technology base. The company was an independent corporate entity until it was acquired as a wholly owned subsidiary by The Attachmate Group in 2011, which in turn was acquired in 2014 by Micro Focus International. Novell products and technologies are now integrated within various Micro Focus divisions. 1.8 "Your Linux is Ready"
The company began in 1979 in Orem, Utah as Novell Data Systems Inc. (NDSI), a hardware manufacturer producing CP/M-based systems. Former Eyring Research Institute (ERI) employee Dennis Fairclough was a member of the original team. It was co-founded by George Canova, Darin Field, and Jack Davis. Victor V. Vurpillat brought the deal to Pete Musser, chairman of the board of Safeguard Scientifics, Inc., who provided the seed funding. The company initially did not do well. The microcomputer produced by the company was comparatively weak against performance by competitors. In order to compete on systems sales Novell Data Systems planned a program to link more than one microcomputer to operate together. The former ERI employees Drew Major, Dale Neibaur and Kyle Powell, known as the SuperSet Software group, were hired to this task. At ERI, Fairclough, Major, Neibaur and Powell had worked on government contracts for the Intelligent Systems Technology Project, and thereby gained an important insight into the ARPANET and related technologies, ideas which would become crucial to the foundation of Novell. The Safeguard board then ordered Musser to shut Novell down. Musser contacted two Safeguard investors and investment bankers, Barry Rubenstein and Fred Dolin, who guaranteed to raise the necessary funds to continue the business as a software company as Novell Data Systems' networking program could work on computers from other companies. Davis left Novell Data Systems in November 1981, followed by Canova in March 1982. Rubinstein and Dolin, along with Jack Messman, interviewed and hired Raymond Noorda. The required funding was obtained through a rights offering to Safeguard shareholders, managed by the Cleveland brokerage house, Prescott, Ball and Turben, and guaranteed by Rubenstein and Dolin. Major, Neibaur and Powell continued to support Novell through their SuperSet Software Group. In January 1983, the company's name was shortened to "Novell, Inc.", and Noorda became the head of the firm. Later that same year, the company introduced its most significant product, the multi-platform network operating system (NOS), Novell NetWare. The first Novell product was a proprietary hardware server based on the Motorola 68000 CPU supporting six MUX ports per board for a maximum of four boards per server using a star topology with twisted pair cabling. A network interface card (NIC) was developed for the IBM PC industry standard architecture (ISA) bus. The server was using the first network operating system (NOS) called ShareNet (aka S-Net). Later, ShareNet was ported to run on the Intel platform and renamed NetWare. The first commercial release of NetWare was version 1.5. Novell based its network protocol on Xerox Network Systems (XNS), and created its own standards from IDP and SPP, which it named Internetwork Packet Exchange (IPX) and Sequenced Packet Exchange (SPX). File and print services ran on the NetWare Core Protocol (NCP) over IPX, as did Routing Information Protocol (RIP) and Service Advertising Protocol (SAP). Novell had acquired Kanwal Rekhi's company Excelan in 1989, which manufactured smart Ethernet cards and commercialized the Internet protocol TCP/IP, solidifying Novell's presence in these niche areas. Novell did extremely well throughout the 1980s. It aggressively expanded its market share by selling its expensive Ethernet cards at cost. By 1990, Novell had an almost monopolistic position in NOS for any business requiring a network. With this market leadership, Novell began to acquire and build services on top of its NetWare operating platform. These services extended NetWare's capabilities with such products as NetWare for SAA, Novell multi-protocol router, GroupWise and BorderManager. However, Novell was also diversifying, moving away from its smaller users to target large corporations, although the company later attempted to refocus with NetWare for Small Business. It reduced investment in research and was slow to improve the product administration tools, although it was helped by the fact its products typically needed little "tweaking" — they just ran. Under Noorda, Novell made a series of acquisitions interpreted by many to be a challenge to Microsoft. Novell acquired Digital Research in June 1991. NetWare used DR DOS as a boot loader and maintenance platform, and Novell intended to extend its desktop presence by integrating networking into DR DOS and providing an alternative to Microsoft's Windows. At first, the idea was to provide a graphical environment based on Digital Research's GEM, but Novell's legal department rejected this due to apprehension of a possible legal response from Apple, so the company went directly to Apple starting Star Trek in February 1992, a project to run an x86-port of their Mac OS on top of a multitasking DR DOS. On the server side, after their initial October 1991 Univel initiative Novell bought Unix System Laboratories (USL) from AT&T Corporation in 1993, acquiring rights to the Unix operating system for their UnixWare. One of Novell's major innovations at the time was Novell Directory Services (NDS), now known as eDirectory. Introduced with NetWare 4.0 in 1993, NDS replaced the old Bindery server and user management technology employed by NetWare 3.x and earlier. In 1994 Novell announced plans to develop a SuperNOS based on NetWare 4.1 and UnixWare 2.0. In 1994, Novell also bought WordPerfect Corporation, as well as acquiring Quattro Pro from Borland. Novell had already abandoned Digital Research's Multiuser DOS in 1992. The three former Master Value Added Resellers (VARs) DataPac Australasia, Concurrent Controls and Intelligent Micro Software could license the source code to take over and continue independent development of their derivations in 1994. Digital Research's FlexOS had been licensed to IBM for their 4690 OS in 1993 and was also utilized for the in-house development of Novell's Embedded Systems Technology (NEST), but was sold off to Integrated Systems, Inc. (ISI) for US$3,000,000 in July 1994. The deal comprised a direct payment of half this sum as well as shares representing 2% of the company. Novell also abandoned their Corsair desktop project and in late 1994 transferred some components to Caldera, a startup funded by Noorda's Canopy Group. In 1995, Novell assigned portions of its Unix business to the Santa Cruz Operation. WordPerfect and Quattro Pro were sold to Corel in January 1996. Novell DOS (and all former DR DOS versions including StarTrek, PalmDOS and DOS Plus) as well as other remaining Digital Research assets (like GEM and the CP/M- and MP/M-based operating systems, programming languages, tools and technologies) were sold to Caldera on 23 July 1996. Personal NetWare had been abandoned at Novell in 1995 but was licensed to Caldera in binary form only. The deal consisted of a direct payment of US$400,000 as well as percentual royalties for any revenues derived from those assets to Novell. In January 1997, Novell's NEST initiative was abandoned as well. In 1996, the company began a move into Internet-enabled products, replacing reliance on the proprietary IPX protocol in favor of a native TCP/IP stack. The move was accelerated when Eric Schmidt became CEO in 1997, succeeding Frankenberg, who had resigned the previous year; Christopher Stone was brought in as senior vice president of strategy and corporate development, reporting to Schmidt. The result was NetWare v5.0, released in October 1998, which leveraged and built upon eDirectory and introduced new functions, such as Novell Cluster Services (NCS, a replacement for SFT-III) and Novell Storage Services (NSS), a replacement for the traditional Turbo FAT filesystem used by earlier versions of NetWare. While NetWare v5.0 introduced native TCP/IP support into the NOS, IPX was still supported, allowing for smooth transitions between environments and avoiding the "forklift upgrades" frequently required by competing environments. Similarly, the traditional Turbo FAT file system remained a supported option. The inclusion of networking as a core system component in all mainstream PC operating systems after 1995 led to a steep decline in Novell's market share. Unlike Windows 3.1 and its predecessors, Windows 95, Linux, and OS/2 all included network functionality which greatly reduced demand for third-party products in this segment. Novell's decline and loss of market share accelerated under Eric Schmidt's leadership, with Novell experiencing an across-the-board decline in sales and purchases of NetWare and a drop in share price from US$40.00/share to US$7.00/share. Analysts commented that the primary reason for Novell's demise was linked to its channel strategy and mismanagement of channel partners under Schmidt. Under Ray Noorda's leadership, Novell provided upgrades to resellers and customers in the same packaging as a newly purchased copy of NetWare, but at one third the cost, which created a "gray market" that allowed NetWare resellers to sell upgrades as newly purchased NetWare versions at full price periodically, which Novell intentionally did not track. Ray Noorda commented to several analysts that he devised this strategy to allow front line resellers to "punch through" the distributors like Tech Data and Ingram and acquire NetWare versions at a discounted rate, as Novell "looked the other way"; this helped fund the salaries of Novell Field Support Technicians, who for the most part were employees who worked for the front line resellers as Novell CNE (Certified NetWare Engineers). Noorda commented that this strategy was one he learned as an executive at General Electric when competing against imported home appliances: allow the resellers to "make more money off your product than someone else's". 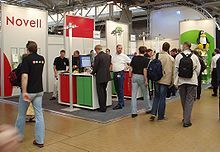 Eric Schmidt embarked on a disastrous strategy to remove the upgrades as whole box products without understanding Novell's channel dynamics, then directed Novell's general counsel to initiate litigation against a large number of Novell resellers who were routinely selling upgrades as newly purchased NetWare versions. Although this move bolstered Novell's revenue numbers for several quarters, Novell's channels subsequently collapsed with the majority of Novell's resellers dropping NetWare for fear of litigation. 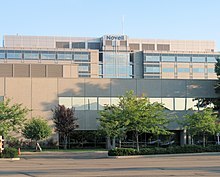 By 1999, Novell had lost its dominant market position, and was continually being out-marketed by Microsoft as resellers dropped NetWare, allowing Microsoft to gain access to corporate data centers by bypassing technical staff and selling directly to corporate executives. Most resellers then re-certified their Novell CNE employees— the field support technicians who were Novell's primary contact in the field with direct customers—as Microsoft MCSE technicians, and were encouraged[by whom?] to position NetWare as inferior to Windows 2000 features such as Group Policy and Microsoft's GUI, which was considered to be more modern than the character-based Novell interfaces. With falling revenue, the company focused on net services and platform interoperability. Products such as eDirectory and GroupWise were made multi-platform. In October 2000, Novell released a new product, dubbed "DirXML", which was designed to synchronize data—typically user information—between disparate directory and database systems. This product leveraged the speed and functionality of eDirectory to store information, and would later become the Novell Identity Manager, forming the foundation of a core product set within Novell. In July 2001, Novell acquired the consulting company Cambridge Technology Partners (CTP), founded in Cambridge, Massachusetts by John J. Donovan, to expand offerings into services. Novell felt that the ability to offer solutions (a combination of software and services) was key to satisfying customer demand. The merger was apparently against the firm's software development culture, and the finance personnel at the firm also recommended against it. The CEO of CTP, Jack Messman, engineered the merger using his position as a board member of Novell since its inception, and as part of the deal became CEO of Novell. Chris Stone, who had left in 1999, was rehired as vice chairman to set the course for Novell's strategy into open source and enterprise Linux. With the acquisition of CTP, Novell moved its headquarters to Massachusetts. In July 2002, Novell acquired SilverStream Software, a leader in web services-oriented applications, but a laggard in the marketplace. Renamed to Novell exteNd, the platform comprised XML and web service tools based on Java EE. In August 2003, Novell acquired Ximian, a developer of open source Linux applications (Evolution, Red Carpet and Mono). This acquisition signaled Novell's plans to move its collective product set onto a Linux kernel. In November 2003, Novell acquired Linux OS developer SuSE, which led to a major shift of power in Linux distributions. IBM also invested US$50 million to show support of the SuSE acquisition. In mid-2003, Novell released "Novell Enterprise Linux Services" (NNLS), which ported some of the services traditionally associated with NetWare to SUSE Linux Enterprise Server (SLES) version 8. In November 2004, Novell released the Linux-based enterprise desktop Novell Linux Desktop v9, based on Ximian Desktop and SUSE Linux Professional 9.1. This was Novell's first attempt to get into the enterprise desktop market. The successor product to NetWare, Open Enterprise Server, was released in March 2005. OES offers all the services previously hosted by NetWare v6.5, and added the choice of delivering those services using either a NetWare v6.5 or SUSE Linux Enterprise Server v9 kernel. The release was aimed to persuade NetWare customers to move to Linux. In August 2005, Novell created the openSUSE project, based on SUSE Professional. openSUSE can be downloaded freely and is also available as boxed retail product. From 2003 through 2005 Novell released many products across its portfolio, with the intention of arresting falling market share and to move away from dependencies on other Novell products, but the launches were not as successful as Novell had hoped. In late 2004, Chris Stone again left the company, after an apparent control issue with then CEO Jack Messman. In an effort to cut costs, Novell announced a round of layoffs in late 2005. While revenue from its Linux business continued to grow, the growth was not fast enough to offset the decrease in revenue of NetWare. While the company's revenue was not falling rapidly, it wasn't growing, either. Lack of clear direction or effective management meant that Novell took longer than expected to complete its restructuring. In June 2006, chief executive Jack Messman and chief finance officer Joseph Tibbetts were fired, with Ronald Hovsepian, Novell's president and chief operating officer, appointed chief executive, and Dana Russell, vice-president of finance and corporate controller, appointed interim CFO. In August 2006, Novell released the SUSE Linux Enterprise 10 (SLE 10) series. SUSE Linux Enterprise Server was the first enterprise class Linux server to offer virtualization based on the Xen hypervisor. SUSE Linux Enterprise Desktop (popularly known as SLED) featured a new user-friendly GUI and XGL-based 3D display capabilities. The release of SLE 10 was marketed with the phrase "Your Linux is Ready", meant to convey that Novell's Linux offerings were ready for the enterprise. In late September 2006 Novell announced a real-time version of SLES called "SUSE Linux Enterprise Real Time" (SLERT), based on technology from Concurrent Computer Corporation. In 2004, Novell sued Microsoft, asserting it had engaged in antitrust violations regarding Novell's WordPerfect business in 1994 through 1996. Novell's lawsuit was subsequently dismissed by the United States District Court in July 2012 after it concluded that the claims were without merit. On November 2, 2006, the two companies announced a joint collaboration agreement, including coverage of their respective products for each other's customers. They also promised to work more closely to improve compatibility of software, setting up a joint research facility. Executives of both companies expressed the hope that such cooperation would lead to better compatibility between Microsoft Office and OpenOffice.org and better virtualization techniques. Microsoft CEO Steve Ballmer said of the deal, "This set of agreements will really help bridge the divide between open-source and proprietary source software." The deal involved upfront payment of US$348 million from Microsoft to Novell for patent cooperation and SLES subscription. Additionally, Microsoft agreed to spend around US$46 million yearly, over the next 5 years, for marketing and selling a combined SLES/Windows Server offering and related virtualization solutions, while Novell paid at least US$40 million yearly to Microsoft, in the same period. One of the first results of this partnership was Novell adapting the OpenXML/ODF Translator for use in OpenOffice.org. Microsoft released two public covenants not to sue users of the open source Moonlight runtime—a workalike for the Microsoft Silverlight rich media platform—for patent infringement. One condition common to each covenant was that no Moonlight implementation be released under the GPLv3 free software license. Initial reaction from members of the FOSS community over the patent protection was mostly critical, with expressions of concern that Novell had "sold out" and doubt that the GNU GPL would allow distribution of code, including the Linux kernel, under this exclusive agreement. In a letter to the FOSS development community on November 9, 2006, Bradley M. Kuhn, CTO of the Software Freedom Law Center (SFLC), described the agreement as "worse than useless". In a separate development, the chairman of the SFLC, Eben Moglen, reported that Novell had offered cooperation with the SFLC to permit a confidential audit to determine the compliance of the agreement with the GPL (version 2). Richard Stallman, founder of the Free Software Foundation, said in November 2006 that changes coming with version 3 of the GPL would preclude such deals. When the final revision of the third version of the GPL license was decided, the deal between Microsoft and Novell was grandfathered in. A clause within GPLv3 allows companies to distribute GPLv3 software even if they have made such patent partnerships in the past, as long as the partnership deal was made before March 28, 2007 (GPLv3 Section 11 paragraph 7). On November 12, 2006, the Samba team expressed strong disapproval of the announcement[clarification needed] and asked Novell to reconsider. The team included an employee of Novell, Jeremy Allison, who confirmed in a comment on Slashdot that the statement was agreed on by all members of the team, and later quit his job at Novell in protest. In early February 2007, Reuters reported that the Free Software Foundation had announced that it was reviewing Novell's right to sell Linux versions, and was considering banning Novell from selling Linux. However, spokesman Eben Moglen later said that he was quoted out of context, and was only noting that GPL version 3 would be designed to block similar deals in the future. In December 2009, Novell announced its intention to lead the market in intelligent workload management, with products designed to manage diverse workloads in a heterogeneous data center. Novell had long been rumored to be a target for acquisition by a variety of other companies. In March 2010, Elliott Associates, L.P., an institutional investor with approximately 8.5% stock ownership of Novell, offered to acquire the company for US$5.75 per share in cash, or US$1 billion. The company declined the offer, saying that the proposal was inadequate and that it undervalued the company's franchise and growth prospects. Novell announced in November 2010 that it had agreed to be acquired by Attachmate for US$2.2 billion, and planned to operate Novell as two units, one being SUSE. As part of the deal, 882 patents owned by Novell were sold to CPTN Holdings LLC, a consortium of companies led by Microsoft and including Apple, EMC, and Oracle. According to Novell's SEC filing, the patents "relate primarily to enterprise-level computer systems management software, enterprise-level file management and collaboration software in addition to patents relevant to our identity and security management business, although it is possible that certain of such issued patents and patent applications read on a range of different software products". Attachmate expressed in advance of the deal closing that there would no change to the relationship between the SUSE business and the openSUSE project. The merger completed in April 2011, with Attachmate paying US$6.10 per share in cash to acquire Novell. Novell became a wholly owned subsidiary of The Attachmate Group, the parent company of Attachmate Corporation. Concurrent with the closing of the acquisition, some of Novell's products and brands were transferred to another of Attachmate Group business units, NetIQ, and the SUSE Linux brand was spun off as its own business unit. The fourth business unit, Attachmate, was not directly affected by the acquisition. In April 2011, Attachmate announced layoffs for the Novell workforce, including hundreds of employees from their Provo Utah Valley center, raising questions about the future of some open source projects such as Mono. In September 2014, mainframe software company Micro Focus announced it was buying Attachmate Group, including Novell, for US$1.2 billion. Service Desk streamlines and automates the provision of IT services. An OEM product from LiveTime Software. ^ a b c Scott, Karyl (1991-07-29). "Novell/DRI merger to reap better client management". InfoWorld: 33. Retrieved 2017-01-21. ^ a b c "Novell and Digital Research sign definitive merger agreement". Business Wire. 1991-07-17. Archived from the original on 2018-08-18. Retrieved 2017-01-24. ^ a b c "Novell completes acquisition of UNIX System Laboratories from AT&T" (Press release). Business Wire. 1993-06-14. Retrieved 2017-01-13. ^ "Novell Execution of "one Net" – Critical Corporate Milestones" (PDF). Retrieved 2017-01-11. ^ Barney, Doug; van Kirk, Doug (1994-03-28). "Novell promises fair play in new climate of competition, support". InfoWorld. p. 6. Retrieved 2017-01-10. ^ a b Allchin, Jim (1992-05-27) [1991-07-17]. "Novell/Digital Research reach definitive agreement..." (PDF) (Court document). Plaintiff's exhibit 828, Comes v. Microsoft. Archived (PDF) from the original on 2016-11-19. Retrieved 2017-01-21. ^ "Unix Labs and Novell plan join venture, reveal bones of mass distribution alliance". Computer Business Review. 1991-10-25. Retrieved 2008-10-31. ^ "Novell formally announces the Unix Systems Group". Computer Business Review. 1993-07-07. Retrieved 2008-10-30. ^ Barney, Doug (1994-07-25). "CCI helps users run more DOS apps - Multiuser DOS Lite handles eight NetWare sessions". InfoWorld: 20. Retrieved 2018-08-19. ^ Pontin, Jason (1995-11-27). "IMS offers Real32 OS for application servers". InfoWorld. Retrieved 2017-01-17. ^ Adams, Brooke (1997-01-22). "Novell Integrating Parts of NEST With Company's Other Divisions". Deseret News. Deseret News Publishing Company. Archived from the original on 2018-08-19. Retrieved 2018-08-19. ^ Magee, Mike (1997). "Novell abandons Nest and prompts Sun to join embedded systems group (440)". Incisive Business Media Limited. Archived from the original on 2018-08-19. Retrieved 2018-08-19. ^ Woollacott, Matthew (1997-02-03). "Empty NEST: Novell dumps universal operating system plan". Infoworld. p. 6. Retrieved 2018-08-19. ^ Shankland, Stephen. "Novell stock down after revenue decline - ZDNet". ^ Prince, Marcelo (26 November 1999). "Shares of Novell Decline As Analysts Cut Ratings" – via www.wsj.com. ^ "Novell warns on earnings - May 2, 2000". money.cnn.com. ^ "Novell Files Lawsuits Against Two Resellers". Novell.com. 1997-03-04. Archived from the original on March 3, 2016. Retrieved 2013-07-17. ^ "Novell Receives Settlement From Aqua Systems, Inc. in Improper Upgrade Lawsuit". Novell.com. 1995-08-22. Archived from the original on May 3, 2016. Retrieved 2013-07-17. ^ "Novell lawsuit charges PMI with infringement". Deseret News. 1998-08-27. Archived from the original on March 3, 2016. Retrieved 2013-07-17. ^ "Reseller Files $5M Lawsuit Against Ingram Micro". Crn.com. Archived from the original on January 4, 2016. Retrieved 2013-07-17. ^ Sweeney, Phil (April 29, 2002). "Cambridge-bound Novell pins recovery on CTP buy — Boston Business Journal:". Bizjournals.com. Retrieved November 4, 2008. ^ Gasperson, Tina (2005-08-03). "Novell frees SUSE Professional under new branding". NewsForge. Archived from the original on 2005-08-05. Retrieved 2017-01-10. ^ "Buy openSUSE - openSUSE". En.opensuse.org. 2013-03-20. Retrieved 2013-07-17. ^ "Cold Realities For Novell". Businessweek.com. Retrieved November 4, 2008. ^ Rosenblatt, Joel (2012-07-16). "Microsoft wins dismissal of Novell's antitrust lawsuit | Business & Technology". The Seattle Times. Archived from the original on 2013-06-30. Retrieved 2013-07-17. ^ "Microsoft and Novell Announce Broad Collaboration on Windows and Linux Interoperability and Support". Microsoft.com. Retrieved 2017-01-10. ^ "Steve Ballmer: Microsoft and Novell Collaboration Announcement". Microsoft.com. Retrieved 2017-01-10. ^ "Microsoft makes Linux pact with Novell — CNET News.com". News.com.com. Retrieved November 4, 2008. ^ "Novell gets $348 million from Microsoft". Linux-watch.com. Archived from the original on November 20, 2006. Retrieved November 4, 2008. ^ "Novell Downloads". Archived from the original on 2014-11-19. ^ "Covenant to End Users of Moonlight 3 and 4". Microsoft.com. December 18, 2009. Archived from the original on 2010-03-01. Retrieved February 23, 2012. ^ "Covenant to Downstream Recipients of Moonlight – Microsoft & Novell Interoperability Collaboration". Microsoft. Archived from the original on September 23, 2010. Retrieved February 23, 2012. ^ "Groklaw — Novell Sells Out". Groklaw.net. Retrieved November 4, 2008. ^ "Groklaw — The Morning After — Reactions to Novell-MS — Updated 2xs". Groklaw.net. Retrieved November 4, 2008. ^ corbet (November 3, 2006). "Various responses to Microsoft/Novell [LWN.net]". Lwn.net. Retrieved November 4, 2008. ^ "Bradley M. Kuhn's Letter to the FOSS Development Community Regarding Microsoft's Patent Promise — Software Freedom Law Center". Softwarefreedom.org. November 9, 2006. Retrieved November 4, 2008. ^ Sanders, Tom. "Novell opens legal books to GPL pundits — vnunet.com". California: Vnunet.com. Archived from the original on September 30, 2007. Retrieved November 4, 2008. ^ "GPLv3 — Transcript of Richard Stallman from the fifth international GPLv3 conference, Tokyo, Japan; 2006-11-21". Fsfeurope.org. Retrieved November 4, 2008. ^ "GNU GENERAL PUBLIC LICENSE Version 3". fsf.org. Retrieved June 3, 2009. ^ "Samba Team Asks Novell to Reconsider". News.samba.org. Archived from the original on October 5, 2008. Retrieved November 4, 2008. ^ "Samba Team Urges Novell To Reconsider". Slashdot.org. Retrieved November 4, 2008. ^ "Groklaw — Jeremy Allison Has Resigned from Novell to Protest MS Patent Deal". Groklaw.net. June 29, 2007. Retrieved November 4, 2008. ^ "News - Linux for Devices". 29 May 2012. Archived from the original on 29 May 2012. ^ "Novell Delivers Workload Automation Strategy, Tools". Datamation. December 8, 2009. Archived from the original on 2011-09-27. Retrieved 2017-01-10. ^ "Elliott Offers to Acquire Novell". PR Newswire. March 2, 2010. ^ "Novell rejects "inadequate" $2B takeover bid". Networkworld. March 20, 2010. Archived from the original on March 24, 2010. ^ "FORM 8-K — Novell Inc". U.S. Securities and Exchange Commission. November 21, 2010. Retrieved November 27, 2010. Also on November 21, 2010, Novell entered into a Patent Purchase Agreement (the "Patent Purchase Agreement") with CPTN Holdings LLC, a Delaware limited liability company and consortium of technology companies organized by Microsoft Corporation ("CPTN"). The Patent Purchase Agreement provides that, upon the terms and subject to the conditions set forth in the Patent Purchase Agreement, Novell will sell to CPTN all of Novell's right, title and interest in 882 patents (the "Assigned Patents") for US$450 million in cash (the "Patent Sale"). ^ "Novell Agrees to be Acquired by Attachmate Corporation". Novell. November 22, 2010. Retrieved November 22, 2010. ^ "CPTN Holdings LLC (acquirer of 882 Novell patents): Microsoft, Apple, EMC and Oracle are the partners according to German antitrust notification". December 16, 2010. Retrieved January 3, 2011. ^ "SCHEDULE 14-A — Novell Inc". U.S. Securities and Exchange Commission. January 14, 2011. Retrieved January 18, 2011. ^ "Details Emerge of Patents Novell Is Selling to Microsoft". PCWorld. January 18, 2011. Retrieved January 18, 2011. ^ "Attachmate Corporation Statement on openSUSE project". Attachmate Corporation. November 22, 2010. Retrieved November 23, 2010. ^ "Novell Completes Merger with Attachmate and Patent Sale to CPTN Holdings LLC". Novell. Retrieved April 28, 2011. ^ Koep, Paul (May 2, 2011). "Employees say hundreds laid off at Novell's Provo office". KSL-TV. Retrieved May 7, 2011. ^ J. Vaughan-Nichols, Steven (May 4, 2011). "Is Mono dead? Is Novell dying?". ZDNet. Retrieved May 7, 2011. ^ Clarke, Gavin (May 3, 2011). ".NET Android and iOS clones stripped by Attachmate". The Register. Retrieved May 7, 2011. ^ Jackson, Joab. "Micro Focus buying Novell, Suse Linux owner for $1.2 billion". Retrieved 2017-01-10. ^ Polishuk, Paul (ed.). Local Area Networks Newsletter. Information Gatekeepers Inc. pp. 4–. GGKEY:B3PUUWYUKBN. ^ "Novell Acquires PGSoft, Inc". Novell, Inc. 2000-02-22. Archived from the original on 2018-09-09. Retrieved 2018-09-09. ^ "Novell Acquires Novetrix". Novell. 2000-03-14. Archived from the original on 2018-09-14. Retrieved 2018-09-14. ^ "Novell acquires Novetrix". Johannesburg: ITWeb. 2001-05-15. Archived from the original on 2018-09-14. Retrieved 2018-09-14. ^ "Senforce". Archived from the original on November 13, 2008. ^ "LiveTime and Novell partner for Novell Service". October 12, 2010. ^ "Endpoint Security Management". Novell Doc. Novell. Retrieved 2014-10-20. ZENworks 11 SP3 Endpoint Security Management simplifies endpoint security by providing centralized management of security policies for your managed devices. ^ "Novell ZENworks Endpoint Security Management". www.novell.com. Novell. 2014. Retrieved 2014-09-25. Novell ZENworks Endpoint Security Management utilizes an installed client application to enforce complete security on the endpoint itself.